The acceptance of being your own person, writing in your own style, not mimicking or falling in line. I get a lot more rejections than I do acceptances, but I don’t dwell on the rejections. There is an art to accepting or rejecting any work. And, although any acceptance is a happy occasion, a particular nice one such as this is always a joy to receive. Heaven’s Password is about a woman who finds herself in heaven, in a line reminiscent of the DMV, and is asked for a password. She’s not the most patient person and can’t remember ever setting up a password. Just like your bank account, you can’t get in without it! This was published in the The Survivor issue of P&G. Bowie and the Basket Case is due out any day now from ID Press. When someone breaks into her house, Anna doesn’t readily find anything missing. But soon she realizes little things are disappearing and reappearing – is someone gas-lighting her? The Healer’s Daughter was accepted by The Ear and will be out May 15th. Self explanatory title? And finally, or so far, Voice of Eve has sent me the lovely acceptance above for my photography and three poems – as you’ve read – June 15th. Thanks for reading, dear souls. Wishing you much love and happiness. January 19th, is the 210th anniversary of Poe’s Birth. Although many people are content with the reason of Poe’s continued relevance in our society is the stereotypical tortured artist. There is no doubt he was tortured, and for reasons of which we are all familiar; he was an orphan who lost every women he ever loved. His battles with alcohol, I believe, are highly exaggerated. But it makes for a good story. I’m not saying he never drank – he drank to excess plenty of times, he may have officially been an alcoholic as we understand the word today; however, it was not a constant. There were many years through his marriage to Virginia that he did not drink or drink to excess. Before his death in 1849, he’d joined the Sons of Temperance Movement – to get people to stop drinking. and artists of all types. He wrote far more than what we, today, consider horror. He wrote essays, literary analysis, investigative pieces. He wrote about street paving, Stonehenge, and he was inspired by what he read in newspapers. Berenice and others were inspired by stories of grave robbers in local papers. 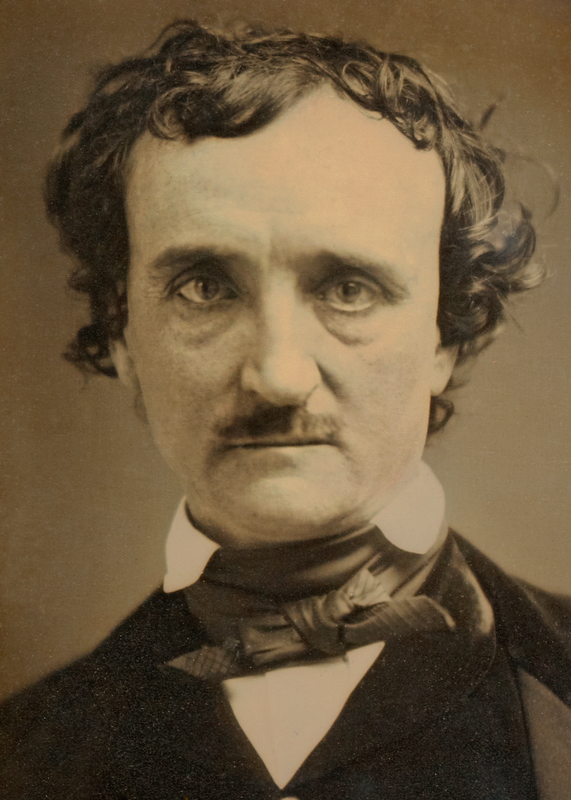 The famed portrait of Edgar Allan Poe was taken three days after his suicide attempt in 1848. He stumbles from the pub, slips, and falls on the iced over bricks of Boston’s November streets. Save for the muddled voices beyond the closed door, the street is quiet as his body thuds to the ground. His breath billows in front of him as he gasps and grumbles and struggles to his knees, then his feet, to regain his drunken balance. The gaslamp on the corner offers a wavering yellow glow for the struggling figure on the lonely winter night. Thin strands of hair blow in the chilled breeze; he runs his hands over his head, straightens himself before he pulls at the sagging overcoat and tugs it closed. Remembering the tinctures of laudanum pried from the chary pharmacist, he hurriedly shoves his hands in his pockets, retrieves the bottles. His heavy breath mounds in front of him and, for a moment, he can’t see; then the luminous cloud of brandy scented air dissipates. The medicines are intact. Relieved, he stuffs them back in his pocket and buttons his jacket. Edgar waves him off without turning around. The thick shadow chuckles as he staggers in the opposite direction. The winter is freezing cold, but the snow hasn’t endured. Small white crystals pile in corners and fill the air. The icy rain soaks him before he reaches his chamber on the second floor of the boarding house. The room is small, impersonal, but warmer than the street. An unlit lantern shimmies on the desk as he unsteadily seats himself, glances out the window. A barely discernable outline disquiets the otherwise muted darkness on the corner of the street below. He knows it’s the black dog that’s stalked him his whole life. Suddenly angered, he shoves himself forward, pushes the unlit lamp aside and topples the ink jar. “Get outta here, you wretched creature.” The incensed command lost in the night. Recovering the secreted bottles of opium from his coat pocket, he sets them side by side in front of him. Unsteadily he tugs the lid from one and snorts in a single gulp. For More Posts on Poe – click this link. To get the book at 3.99 – this weekend only – click this link. To get the ebook at .99 – today only – click this link. I know people say writing is a commitment, but it’s more than that. Writing isn’t “like” a relationship, it IS a relationship. A writer must be involved with the whole process of writing, must love it, need it, want to continue to work to make it better. It takes commitment, time, dedication, and the desire to move forward in life with writing. My friend joked, “Noreen does this thing where she actually spends time writing.” My regular action became fodder for humor because he is a writer, but he falls under the category of non-writing writers like many others. Life happens. We have families, pets, jobs, homes, tons of responsibilities. But notice that list – I put family first. People we love comes first. This is why a writer might consider writing as a relationship – so they give it priority. I schedule things around my writing whenever possible. I will make doctor appointments, meetings, and everything I have power to plan secondary to my writing by scheduling them before or after my planned writing time. Once a person considers themselves in a relationship with their writing, they may naturally form relationship goals! If writing were a romantic relationship, how would you handle it differently? Would you want to go to sleep with it or wake up with it or both? What would you want to give it? Would you spend more time with it, going over the details, working it out so it was just perfect, going over it and over it again to work it out nice and smooth? What do you do for your significant other? Take it out to dinner? On vacation? Writing, like a lover, needs constant attention and nourishment. Placing it on the back burner means we may never get to it. It’ll be there, but not as warm and flush as we’d like. Being in a relationship with writing means the needs of both are fulfilled. Writing is fresh and flowing and continually improved and the writer is happier, more productive. We do this because we love it, we are driven to do it. Treat writing like it’s important to you. Think of writing before you fall asleep, when you wake up in the middle of the night just to say one more thing. Sticking to their word, Delphinium blooms again. The lovely editors at REaDLips have promised to give some of the proceeds of Delphinium’s Summer Issue 2017 (and going into the future) to literacy programs. I’m beginning to appreciate Delphinium and those at REaDLips more than ever. They are showing themselves to have a heart, to care about our society. I am more than proud to be affiliated with this journal, proud to be published a long side amazing award winning authors as well as my own students. That’s right! Lynn Johnson was a student in my African – American Literature class. Her poem, published in Delphinium, was one she wrote in response to one of our readings and shared in class as part of her creative project. I hope you’ll give Delphinium a read, and not because I’m published in it (well, not JUST because), the journal features authors and artists of diverse cultures and it will benefit art and literacy programs. A prompt in a writing group to think about style inspired me to consider the evolution of my own writing style. Writing evolves, grows, hopefully gets better, with all we learn and experience in life. But style is something a little different. Style, sometimes, doesn’t change. Or, I should argue, doesn’t change that much. Maybe, it’s the small changes that only a critical reader might notice. Last year, when I published Here in the Silence, I felt the stories earned that title. All the protagonists were struggling with finding their own voice. They felt silent or silenced, either from their own lack or from those around them. This year, with Namas-Cray, my characters are different. Some are still struggling with being heard, (Of Strays and Exes), while some believe they are completely aware of who they are and what they want (A Perfect Day). There’s darkness, but there’s a dark ironic humor that embeds itself in their thoughts and actions: “Of Strays” begins with “When I killed my neighbors dog….” and in “A Perfect Day” a woman’s suicide is interrupted by an armed burglary. What’s different between these two years of writing is the ironic humor. And, I’ve noticed that’s worked it’s way into most of my writing, including my poetry, “The Fly” features a fly who has “24 rose colored hours” of life, both celebrating and loathing those hours. I’ve always handled my own life’s struggles with humor. When my daughter was a teenager, she looked at me and said, “Is everything funny to you?” Anyone who has a teenager knows – it’s got to be funny or you’ll lose your freaking mind. Therefore, to answer her question, I gave her a long, slow nod (gritting my teeth). Does that mean my writing style will make you laugh at the dead dog or at the woman’s suicide attempt? Absolutely not! That’s where the irony comes in. It’s subtle and sardonic. The protagonist in “Of Strays,” offers to pay for the dog. She doesn’t quite get the loss. But the protagonist grows to understand. And, in “A Perfect Day,” suicide is never a humorous topic, but our very serious plans being interrupted by life is something everyone can relate to. Her day is no longer so perfect when an armed robber says, “your money or your life.” And his plan, certainly, is not going as well either. Irony! One of my students believes that “humor” should never be used in conjunction with a serious topic. In many cases, this is true. But we have to look at the irony surrounding the fiction that is how we learn and grow; introducing a topic with subtly allows the readers a way in to understand the situation, relate, empathize. The same is true of our lives. If you slam someone with truth, they are likely to back off and not engage. We introduce ourselves first, our struggles, along with the irony of moving on in our lives. Let’s take a look at my life – what has happened in my life that might have made me feel more sardonic. I teach a report writing class, which I run like a lesson in professionalism. How you present yourself as well as your writing says a lot about the person you are. And then comes this Presidential campaign. How do I tell my 18-22 year old students to act like a professional when #45 acts like a spoiled child who’s had too much sugar? (According to the students, btw, I did a great job. Let me say, that I absolutely loved it! We built some iron bridges of communication in that class that I hope the students take out into the world with them. I took the course for a number of reasons, one of them was the above #45. But that’s a whole other story – We’re focusing on irony, life, writing style). I do believe life affects writing style. Everything we learn, do, experience, and want should affect our writing style. We should grow and evolve as humans and as writers. I was stuck once on a story. I’d been working with it, not quite able to get it to that sweet spot, when I decided on a vacay to New Orleans. I’m not much of a drinker, so it’s not the absinthe smoothies on Bourbon Street that inspired the trip, so much as the fanfare, the history, and the culture. I might have thought about the story while I was there; I don’t really remember. But, upon my return, the answer materialized. The story became what it needed to be. (It’s under consideration for an award as I write this). That trip has stayed with me, as well as my other travels, other experiences: the homeless man at Starbucks focusing with intensity on a spiral bound notebook as if he was finishing his own novel – “$1.00 Stories” – the psychic who told me my illusion bubbles had burst “How to Throw a Psychic a Surprise Party” and so on. We must let life affect us, work its way into us, our style must evolve, or we stay stuck in life and in art. I’m interested in hearing thoughts on this. Do agree? Disagree? Has your style changed? How or why? I always have wanted to own a Munster-like house. now the stalkers know – don’t be a stalker…. Poe wrote essays about Street Paving, Composition, and even an intelligent, very modern piece, regarding Stonehenge!